Sterling silver is a mix of 92.5 percent silver and 7.5 percent copper or zinc. The added metals provide much-needed strength to functional silver objects like candle holders. Sterling silver has become very valuable and pieces crafted from it can make attractive additions to antique collections. Copper and silver are remarkably similar in terms of malleability and copper is often plated with silver making it difficult to tell the two materials apart. 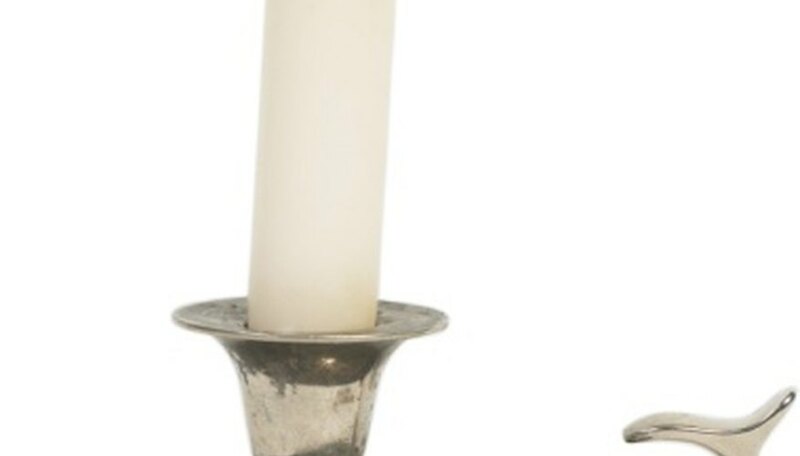 There are a few techniques you can use to ensure that your candle holder is genuine silver. Locate the stamped markings to identify real silver candle holders. Silver items will be stamped with the numbers 925, 900 or 925/1000. They may also be stamped with other markings by the silversmith or a foreign country's assay office denoting the purity of the silver. An absence of markings is a sure sign that the item is not sterling silver. Check the tarnish color for other signs of plated silver. Silver plate will tarnish to a blue-purple color while sterling silver will be gray-black. Test the item if you are still unsure of its authenticity. This test requires you to scratch the candle holder, so use it as a last resort. If you want to conduct the test yourself, get a silver acid testing kit and scrape off a little of the silver. Place a drop of nitric acid on the scratch and use the provided color chart to determine the silver content of the candle holder. If you do not want to test the candle holder yourself, you can take it to a jeweler who will conduct the test for a small fee. Nitric acid is toxic and corrosive. Take care when handling it. Herman Silver: How Can I Tell If a Piece Is Solid Silver or Plated? Indigo Silver: What is 925 Silver?